I really believe in the power of travel. It gives you this depth of perspective and it's a firsthand understanding of what the world is really like for so many people. It's very grounding in a way, even when you're on the road. It's grounding because of what you come through to get there and just seeing how much love and compassion we have around us all the time. Although Mo Duffy Cobb has spent years as an English teacher, a French teacher, and an English as an Additional Language teacher, it took traveling across 12 countries in 9 months to discover that no other language transcends all barriers like the language of motherhood. Duffy Cobb learned this when, in the aftermath of a stillbirth, she abandoned the comforts of her home, friends, loved ones, and everything that made sense to her to embark on an epic journey with her husband and two-year-old daughter, Leila, in tow. During those nine months, motherhood became her connection and means of communication with mothers worldwide when a common language was not an option. 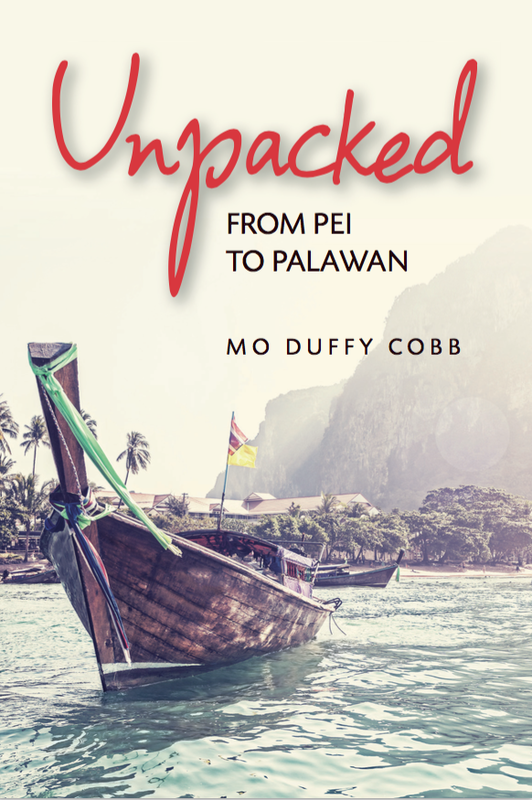 Duffy Cobb, founder and editor of Cargo Literary Magazine and author of the debut travel memoir, Unpacked: From PEI to Palawan, is an Islander of Charlottetown, Prince Edward Island in Canada, and has always had a desire to travel. Literary Mama's Creative Nonfiction and Fiction Editorial Assistant, Kim Ruff, was compelled to connect with Mo Duffy Cobb after watching the YouTube book trailer for Unpacked because she, too, had suffered the loss of a child—her 16-year-old stepson, Ryan. In this interview, Ruff speaks with Duffy Cobb about transparency, world views of motherhood and grief, and rediscovering oneself in the wake of a child's death. Kim Ruff: Before we start, I want to offer my deepest condolences to you and your family on Tya's passing. Mo Duffy Cobb: I feel like she left me with this gift, a purposeful writing project that I really wanted to share with the world. She would have been nine this year; so much time has passed. We still celebrate her birthday and that kind of thing, but it doesn't make us too sad anymore. It's important now to move past sadness and onto a platform of advocacy for other women who have had losses when they're not sure what to do, not sure how to feel, or not sure what's okay. That's how I feel, now, but thank you. KR: Thank you for speaking out about your experience. I'm sure it has helped other mothers feel less alone. MDC: Sadly, loss is a common scenario in motherhood. It is a weight we carry as mothers. My grandmother lost a baby too—her first. Mom said she could never talk about it, which was the custom at the time, more than 70 years ago now. We've come a long way in making it okay to talk about the pain and the grief that comes from baby loss. Now we are stronger emotionally, and we are moving on together. Moving on from the darkness is an overarching theme in Unpacked. Seeking healing and renewal is a personal process, too. I mean everybody goes through it in their own way, but it's something each person must do on their own. KR: I want to ask you more about your experience in connection with your travel memoir. What made you decide to share this experience with the world? Not just the loss of Tya, but also the uprooting of your family, leaving the comforts of home to "run away" from your grief to another country, and the transparency about the tense moments in your marriage? MDC: After Tya's death, I really needed to shake things up. I needed for everything to be different. I wasn't playing the victim very well, and we live in a small town where everybody knew about our loss. I thought that it was a good opportunity to take my family on a wonderful adventure and to push through whatever grief I needed to go through. I had ordered tons of books from the internet and I read everything that was out there for moms who had lost babies, but they were all written by doctors or psychiatrists. They were just encyclopedias of how you can lose babies, what causes stillbirth, etc. Everything seemed so sterile and analytical at the time, and nothing was personal and raw. There weren't a lot of memoirs. I loved Joan Didion's The Year of Magical Thinking so much, but it was, of course, about her husband. I loved her investigative process into grief and what grief is. I wrote Unpacked because it was a story that was different; it was a book about this grieving mom and a story of her travels through Southeast Asia with her young family. The juxtaposition worked, because I had this wild adventure for a location, and, then, I had this deep, interior-rich journey of grief, of loss, and of how to communicate with the world again, so, at the end of the nine months, on the flight back to PEI, I started to write this story. KR: Was it difficult to be transparent, knowing your friends and family were likely going to read this book? MDC: It was tough to put that transparency on paper, knowing that my loved ones would absolutely read this book. They would probably be the first people to read this book [laughs]. In earlier drafts, there were no fights with Mitch, no tension whatsoever. I really wanted to protect him and protect our relationship. While workshopping the book at Vermont College of Fine Arts (VCFA), one of my teachers said she loved the memoir, but it lacked honesty. She asked me to look back into the marriage and create more realistic scenes. That's when I really had to go into the memoir with a deep questioning of what it means to be in a relationship. There were many times when I was difficult to get along with, and I had to acknowledge that. This was probably even more enlightening for me. If I was going to write about his faults, then I had to write about my own, as well. KR: When you started on this journey, you recorded experiences and talked about keeping a journal. Did you have any idea before you left that a memoir was going to come out of this? MDC: Oh, no, that was never the intention. When we were flying out of the Philippines, Mitch and I were in this small family restaurant with the owners' kids running around. There were donkeys outside looking in through open doors and dust in the air, and we were eating eggs on toast in plastic chairs in the middle of it. I just loved this scene, and I wanted to share this experience, but I didn't really know very much about the publishing process. I had dabbled in writing, but I never considered writing seriously. At the time, I didn't think either of the narratives could be strong enough, the grief narrative or the travel narrative. I had this idea that I wanted to write about the deconstruction of the Western parent. That is what Mitch and I were feeling at that time. Travel had changed our perspective. I was deeply affected by the freedom given to kids in the Philippines. These kids owned the streets; they ran around barefoot, climbed up coconut trees, and ran into the ocean with their clothes on when they felt like it. Parents left their kids to be kids. It just seemed so liberating from a parenting perspective, and I thought, wow, this is what parenting can look like, too. KR: I had a question about that thought because, when you were in Cambodia, you had a revelation about Western parenting privilege, and you asked yourself, "What did I really lose in comparison to what Cambodians lost during the genocide?" MDC: The Cambodia chapter was difficult to write. Being engrossed in Cambodia's genocidal history and walking through its prisons was an unbelievable experience. Although we had lost one little baby, Cambodia had lost thousands. It gave me a very epic perspective on grief culture. When you think about Cambodia, it's the resilience of people and women and families everywhere that stands out through the grief. I did have a sense by the end of that chapter that I'd been nurtured and protected in my grief. People brought me food, clothes, and everything I needed. I had so much support and love around me, everything I needed. The poverty in Cambodia was also disconcerting. We had to face our Western privilege, and I struggled with this when writing the book. It was difficult to acknowledge just how privileged we were to be able to travel to Asia in the first place. KR: In the book, you talk about letting go of Tya's death—the pain, the sadness—because you've realized that your life, in comparison to what you've seen in your travels, was abundant. Now that you are back in Canada, how do you keep that perspective? MDC: Two years ago, I was working with Afghan women writers, providing them help with their English. It was an eye-opening experience as many of their stories involved flight in the night or the dangers around going to school. I have two daughters. It's important to share with them what a privilege it is to even go to school. It's also essential that we prepare our kids for a world that is changing and see where they can be part of the solution. Promoting gratefulness, mindfulness, and welcoming families of refugees that come here to our lands or working with organizations that bring people together all help keep that perspective. KR: I think most women, and men, too, have this ideology of what it's going to mean to become a parent and who they will be as a parent. How did your experience—not just Tya's passing but the traveling and what you were exposed to—permanently change your ideologies of what it means to be a mom? MDC: I really try to build in that time for freedom for the kids. We know from books like Nurture Shock by Po Bryson and Ashley Merryman that overprotection is damaging to our kids. We are always parenting on this fine line between giving kids enough structure and letting them make their own decisions. Being exposed to new methods of parenting changed the way I interact with my kids, even Veda, who is just shy of two. The women in the Philippines trusted their process, trusted their family, and trusted their kids. That's what I try to do, too—especially since I have the luxury of living in Prince Edward Island, which is a very safe place. KR: There were several instances throughout your book where you noted that Leila was your connection to the world and other instances where you talk about how she centered and grounded you many times during the travels. How different would this trip have been without Leila? MDC: My gosh, we were operating on a toddler's routine. Early outing, snack, exploration, break. Lunch. Nap. Maybe try a third outing if we really wanted to push things! We always had to be prepared, carry rain jackets, and carry apples. If she hadn't been with us, we may have taken advantage of more adult-style traveling: nightlife, mountainous hikes, long boat rides down the Mekong. We always had to keep things pretty PG, not totally risk-free, but with a level of certainty. Leila did keep us on the level of daily play with other kids, and she was my biggest connection with other moms. KR: In thinking about Leila serving as your connection to other mothers, you write, "The real language here was motherhood." I'm curious to know how does that language of motherhood continue to break barriers for you in PEI? MDC: It's interesting that you ask that because there has been an increase in Afghan and Muslim families that have come to PEI. I make it a point to talk to those families and welcome them because I've been on the other side, too, where I was the new one. I remember how that feels, and I want to pay it forward. So, I always make an effort to speak to families who are new to the neighborhood, even if it pushes me out of my comfort zone. I try to acknowledge others' backgrounds as well, like saying "Thank you" in Mandarin, or asking them how they like Canada so far, or if they miss their home country. Each new interaction matters. It doesn't have to be long. It's just nice to talk to somebody, especially when you have kids the same age. So many communities are multicultural, so I think it's important to push yourself to have these conversations and make other people feel welcomed. It's what I try to do anyway. KR: Sometimes I feel alone in grieving the loss of my stepson. What I mean is that people will ask me how my husband is doing with the loss, seemingly dismissing the idea that I am grieving as well. Although we had different experiences, your book represented to me every mother's loss, even that of a stepmom. If you had to summarize, what do you think Unpacked represents? MDC: Well, it represents the idea that finding yourself may be risky but often has a beautiful reward. It has to represent letting go, one day at a time, a reconstruction of ourselves in the present tense. Putting the pieces back together in the face of grief. A baby loss is different in that there is grief for part of oneself, a future life never lived. It also represents unity—a universal family-hood touched by human connection and passage. We are all born, we grieve, we celebrate, and we honor the dead. I don't know if I did everything I set out to do in this book, but it definitely opened the door to many issues for me, which has been amazing. I'm having a lot of these conversations now that the book has been published. KR: Will any of these issues come to light in your next book. Where are you with it? MDC: I'm just building the proposal now, but, yes, I would like to learn more and be witness to the refugee crisis in Syria. We have had many Syrians in Canada who've just come in, and there is a great focus on displaced people. The search for global motherhood will be the underlying story and the daily struggles that many women are facing whether they are living in a camp or if they've been resettled in Canada. Mothers with kids still need to make bread every day, bring kids to school, practice their traditions. I want to explore their new norms, wherever they are in the transition process. I hope to connect mothers on a global scale, to celebrate our unity in a world where political lines are trying to divide us. We are all families with struggles and similitudes, searching for meaning. Kim Ruff graduated with an MFA in Creative Writing: Nonfiction from George Mason University in 2014 after serving eight years in the United States Air Force. Her personal essays have earned her honorable mention in Prime 53’s 53-Word Contest, two scholarships, and publication in the Virginia Foundation for the Humanities and Cornerstone Magazine. She lives in Delco with her husband of eighteen years and their two children, and loves her work as a Proposal Manager. I, too, suffered the loss of a stillborn daughter in 1997. It propelled me to write a self help book for moms because I could not find any books that validated my grieving journey. I look forward to reading your book, Mo. Thank you for writing it and thank you for this great interview. My heart goes out to each of you on your losses.